1. Of what house of Israel was Moses born into? 2. For how long did Moses' mother hide him? 3. What was the ark make of? 4. What was the ark covered with? 5. 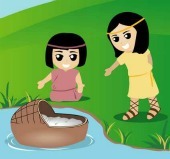 What was the ark laid among on the river? 6. Who watched Moses in the ark from afar off? ? 7. What person came down to wash at the river? 8. Who went to get the ark? 9. What was Moses doing when the ark was opened? 10. What type of woman did Moses' sister say she could call to nurse the baby? Question 1: Levi Answer 4. Question 2: 3 months Answer 1. Question 3: Bulrushes Answer 3. Question 4: Slime and Pitch Answer 2. Question 6: His sisterAnswer 3. Question 7: Pharaoh's daughterAnswer 2. Question 8: The maid Answer 3. Question 10: A Hebrew Answer 4.